Yesterday, I managed to write bout the new Marriott Rewards 2016 Global Promotion twice (read more here and here). May members received an error message (myself included) that their account was not eligible for this offer. I got my issue resolved. You can sign up for the Marriott Rewards 2016 Global Promotion here. If your account for some reason is not eligible for this promotion and you get an error message during the registration process, you need to drop an email to Marriott Rewards. I was trying to sign up this promotion that is open for all Marriott Rewards members but received an error message that my account is not be eligible. Please fix. I apologize for the difficulty you experienced attempting to enroll in the 2016 Summer Global promotion. I have successfully enrolled your account in the promotion. The earning dates are May 24, 2016, through September 5, 2016. Your account was selected to receive 2,000 points per stay starting with 2nd paid stay (Maximum 10,000 points). A stay is defined as one or more consecutive paid nights in a hotel. Well. 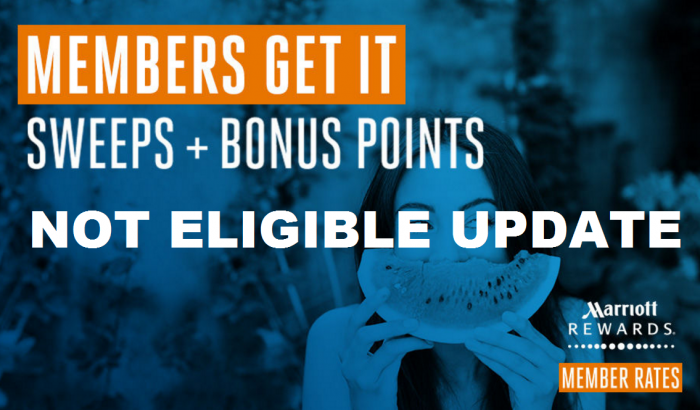 They should have signed up my account for the promo that also comes up with 2,000 bonus United miles as my account is registered with the RewardsPlus. I may drop them another email. If you had trouble registering for this offer, just drop an email to Marriott Rewards using the Contact Us form on their website (access here). At least Platinum account should receive a reply within a day or so.